If it's true that the DL Lives don't have a time limit, then would that mean that those late to the party still have a chance of getting the outfits at least? Those are the ones that are rewarded from the EX Clear, but accessories might be missed forever if they're pulled from the drop pool. We'll see in a week I guess. If they don't have a time limit that would mean that people late to the party would still be able to get everything. But yeah, we will see in a week. I'll definitely try to get the costume by then. I don't care much about the accessories. That means if there is no time limit I bought over $150 in p-drops for nothing because I was worried I wouldn't be able to get the DL accessories in time. So far I've only gotten the ring and garter by dropping over 50 p-drops each time. Haven't drop anything 'naturally' yet. I did find it weird they gave just a limited time to unlock the outfit and accessories. Would make more sense if it were just the download time and free p-drop availability that was limited. The line directly underneath Iori's picture states that the DL live is NOT limited time. However the 11 free P drops are limited and you can only claim them from the 17th through the 30th. I thought it was weird that nothing in game said anything about a deadline so I'm glad there's some clarification now. Now that I look closely to both DL lives articles (current and the next one), it is clearly stated they are not time-limited. So you'll be able to download it next month or whenever you want. The only time-limited offer is p-drops. From what I can read, the blog post for the 1st DL Live didn't mention anything about limited time or not limited time at all. It does state that the P drops are limited in the first post too so I think that's where the confusion came from. Is there a certain level requirement you need to be at to complete these lives? Not to participate them afaik, but to be able to actually beat (as in, ex clear) them, yes there is some implicit level requirement since you need to reach a high enough score. There are time related drop issues which actually arise if (and we need to wait for the confirmation) the DL lives are not time limited though. There's some math involved, but I promise, it's simple. Now for catalog 1, you have a 1/10 chance of getting a specific item. 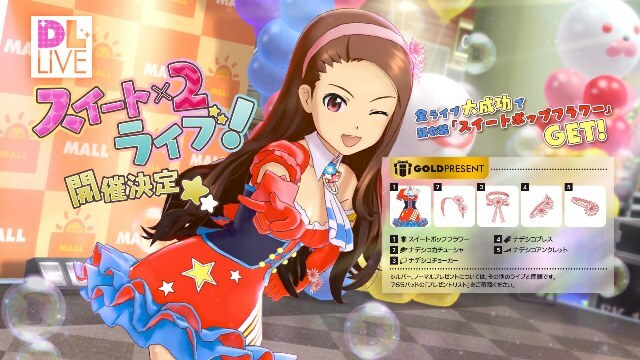 DL live 2 will add in 4 more accessories to the Gold drop list. So the odds of getting as single item are now 1/14. Okay, you ask, but wouldn't this mean that I have more chances of getting A DL live item? Yes, until you remember one thing - You can get DOUBLES, and can do so forever. Capped an item to level 10? You'll STILL get doubles. In short, constantly adding to the gold drop list actually makes it significantly HARDER to complete the costume collection, not easier, and this problem only compounds, increasing the difficulty by 50% each DL live. So given how often Gold presents drop (Namely, for me, without pdrop interference I see one every 300 lives or 35 HOURS) you could be there... oh, from now to sometime before the heat death of the universe, because the odds go extensively long. afaik the special DL live items from gold presents only drop in the corresponding DL live, and the DL live only drops these items in gold presents. So the DL lives should't influence the collection completion for the trophy at all. In fact, if you are going for the trophy, you should avoid playing the DL live more than necessary and spend your time on other events. That said: my guess is that turning in gold cards is the same as opening a gold present. And at least with silver cards you can close and restart the game if you don't like what you got (e.g. the xp drink für 10k xp) and try again. So i assume this works with gold cards as well. So it's probably best to keep your gold cards until you only need as many s rank costumes as you can turn in with gold cards. Using reloading you can make sure you get the costume you are missing, and while this probably will take some time, it's certainly faster than hoping for the correct drop from a gold present. The fun part? That's incorrect - I forced the DL live 1 ring to drop from the S ranked All star. Yep. it's just 'very unlikely', but nowhere close to impossible. The gold cards have a restricting mechanic which I've extensively tested - The gold cards encompass all A and B rank items as well, and as far as I can tell (After a LOT of resets) cannot generate an item you don't actually have. I'm either incredibly unlucky (And computers don't work the way they should) or there's a lot of assumptions in place. If you can catch me online we can work together on this part, as I have setups ready to go to test, if you can find me out of work hours.